It’s always great when you learn something new, especially when you’re eating some fabulous tasting food. 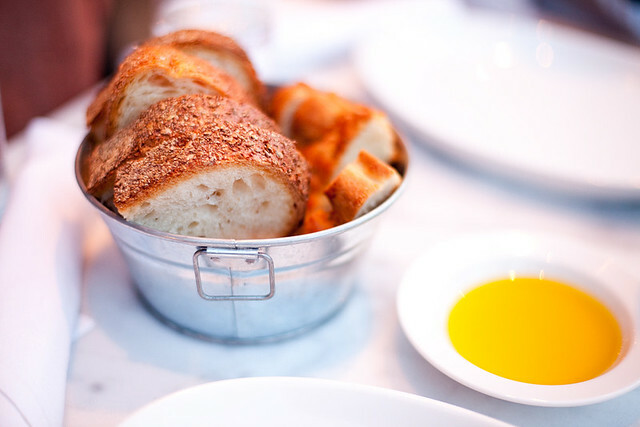 Couple weeks ago I had a grand meal at Osteria il Paiolo in Williamsburg with my friend Melissa. What I learned that night was how proper polenta is made, in a giant copper pot or a il Paiolo. 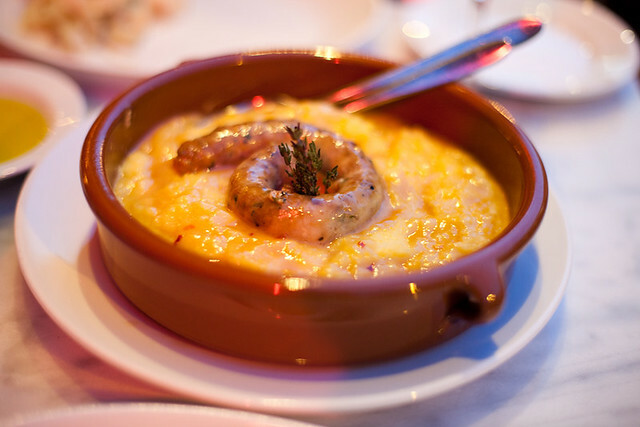 In keeping with his family tradition, owner Alex Palumbo makes sure to make his polenta in a il Paiolo. Unlike most polenta I had, this was extremely creamy yet there was no dairy added to it whatsoever. 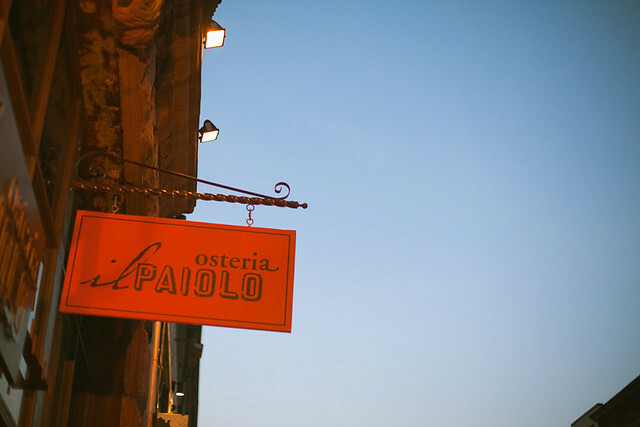 Osteria il Paiolo is one of the few restaurants in Williamsburg to have tables on the sidewalk. Go enjoy your summer nights with a glass of wine and some fantastic polenta. We started off our meal with “Polipo e Patate” octopus and potato salad. A really nice simple light salad with tender chunks of octopus. Then it was followed by “Polenta e Luganighe” polenta and sausage. While it may look heavy, the polenta was light and fluffy. May I get a whole bowl just of that next time? The sausage was good also and added some great meaty flavor to the polenta. OSSO BUCO! This is my only second osso buco ever in my life. 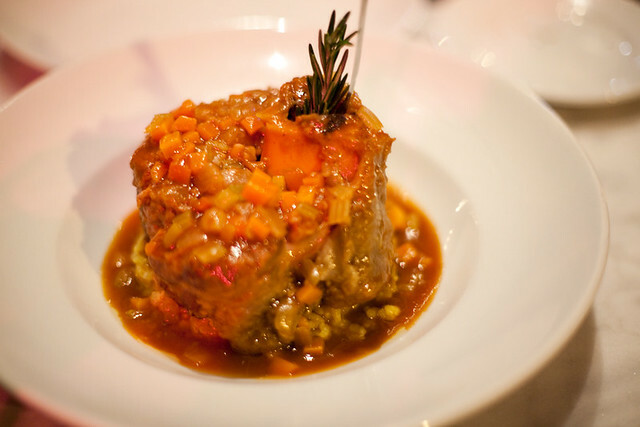 A braised veal shank with saffron risotto on the bottom. May I get a whole bowl of the risotto also?! Similar to the polenta, the risotto was creamy but a little heavier in its richness and flavors. And I think it needs to be that heavy to hold that hunk of delicious looking shank. This, my friends, was incredible. Super falling off the bone tender. Be sure to scoop the marrow out and mix it into the risotto for a fine fine bone marrow risotto (EEK!!). 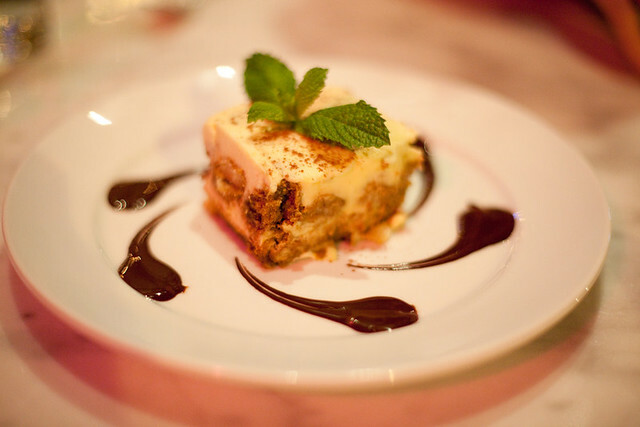 I couldn’t leave the dinner without trying their tiramisu. If I see it on a menu, I will order it. And the one from Osteria il Paiolo was just straight up good. I learned a great deal about Alex and the food of his family when we were chatting a bit between each course. I suggest you doing the same because learning something new or getting to know the owner and his/her point of view will definitely enhance the food and your dining experience. Check out a great interview with Alex Palumbo over at Nona Brooklyn.